A Linear Induction Motor (LIM) is a specific type of alternating current (AC), multiple-phase machine that provides force and movement in a linear direction. Numerous applications of LIM’s can be found in industry today, one of the most interesting being high speed magnetic levitation railway systems. The fundamental goal of this project is to determine the reasons for the limited functionality of the previous team’s SLIM design. 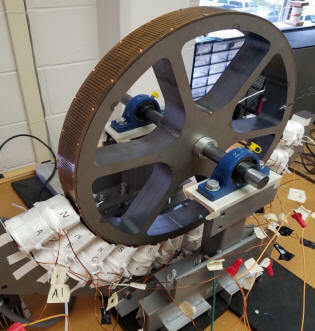 The current SLIM is using a rotor that was used for a magnetic levitation senior project. It is suspected that the problem with the existing rotor is that it has no ferromagnetic material beneath the conducting bars to increase the flux density in the air gap between the stator and the rotor. Therefore, a new rotor will be designed with a better magnetic circuit for this application. The SLIM will be thoroughly tested with the new rotor to quantify the improvement in functionality. If time permits, a microcontroller interface to provide operator input will be used in conjunction with a speed sensor and a Variable Frequency Drive (VFD) to provide simple open-loop control of the of the rotor speed.